As a part of an academic assignment we were required to perform a research of a firm in our first semester. The assignment was of 'Management', one of the two core subjects and most favorite subject of mine in the first semester of BBA. 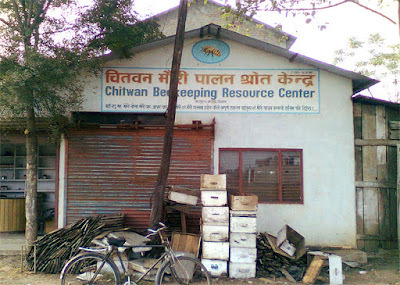 I chose to research on 'Chitwan Beekeeping Resource Center', a firm which is located not too far from my house. I was especially interested in this firm because I was more interested to know about the profession of apiculture, i.e., beekeeping, and that was because I wanted to know whether honey produced from these farms was really nutritious or not. This was however, my personal objective and not the objective of the research report in itself. Adding personal objectives helps me work with higher dedication and that's my personal strategy. My research was all about collecting information about the firm and I used two measures for that purpose. I am describing them in brief below to let you know how I did this job. I hope it will help you do your first research work in your undergraduate course of study. I went to the firm to collect various information. In the meantime, I interviewed Mr. Krishna Bhusal, the founder and the sole proprietor (owner) of Chitwan Beekeeping and Research Center. Although the interview wasn't a very formal one, I did indeed prepared the questions beforehand and noted the answers in my notebook as the owner responded to my question. While taking an interview is a problem for many students it is an opportunity for students like me. You don't have to worry about losing your job or anything even if you make mistakes. At the worst case scenario, you may have to search for a new firm and start the whole work again. However, at best, you'll learn some essential communication skills and get good response from the firm owners. So, it should never be taken as a burden. 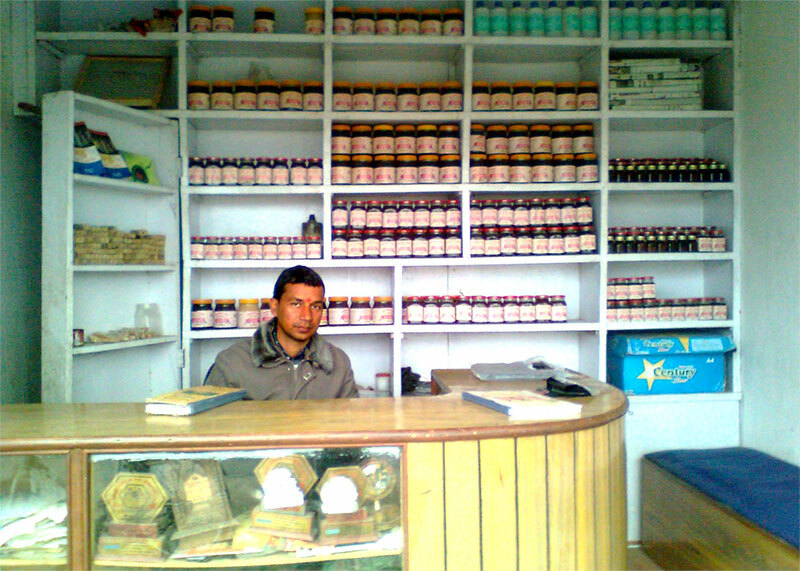 Mr. Bishnu Bhusal at his own honey retail shop situated in Bharatpur - 9, Saradpur. To be back, my experience of taking the interview of the firm owner, Mr Bishnu Bhusal, was really very enjoyable and interesting because he was very positive about my research work and was eagerly sharing his knowledge and information related to the firm and beekeeping profession. As a result, I was very elated to work harder and visit the firm multiple times to interview the proprietor. During my whole research period I visited the firm quite often, about 6 to 7 times at least, and every time the owner was enthusiastic to talk about beekeeping with me. The second way I used to gain knowledge about Chitwan Beekeeping was by observing the honey production and processing site. 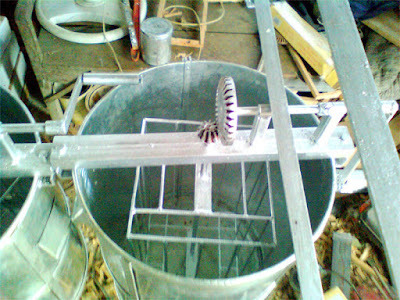 Below are the pictures of honey extractors, the machines used to extract honey and the honey store house. And you might be surprised by not seeing the images of the bee hives or the honey-processing plant in this whole post and my report. 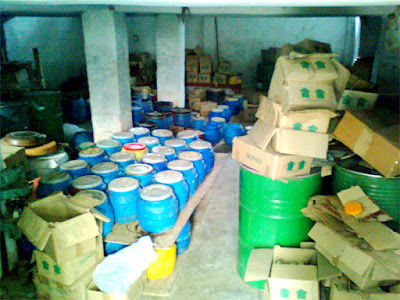 However, the bees had been sent to a place called 'Meghauli' for grazing (means collecting nectar) and the "Honey Processing Plant" was situation inside the dark room. Therefore, I couldn't take a photo of these two things which would have been quite relevant in my report. This particular fact that the bees had been taken to a forest for grazing led me to an important conclusion that honey produced in commercial scale like this can also be quite nutritious and healthy. From what I have come to know about from there, honey is naturally produced and thus very beneficial for our health. 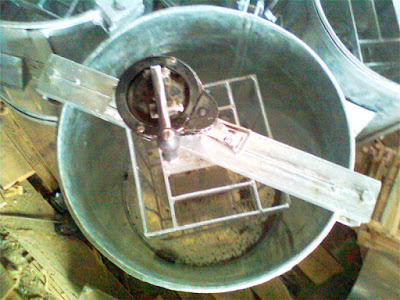 However, the use of pesticides in the farms by the farmers have negative impact on the bees and the quality of honey. Therefore, when farmers put insecticides on their mustard field they are not only damaging their own land but also hampering the honey bees. So, this trend should be stopped for the good of everyone. These two extractors are different in the sense that they are used to extract honey from the two different species of bees: Apis serena and Apis Mellifera. 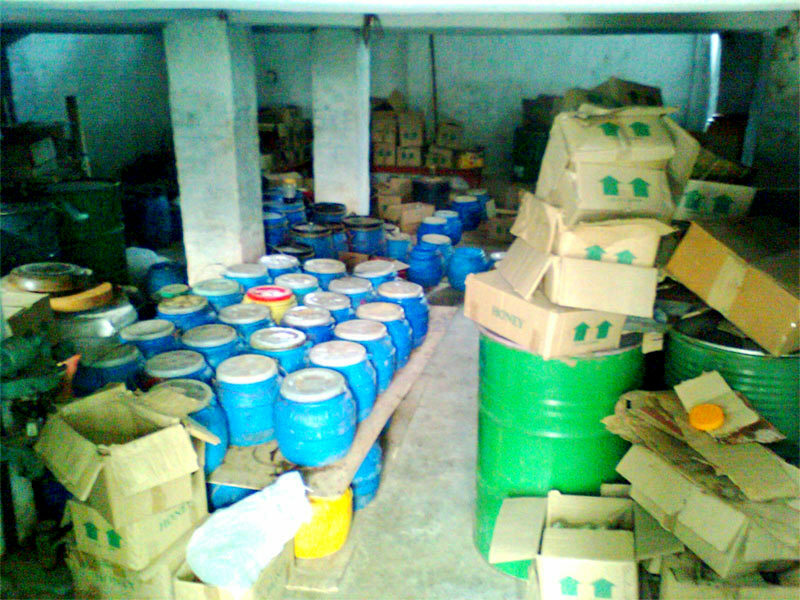 The picture on the right is of the storehouse of honey. As you can see, there's a huge stock. Also it is noticeable that the inside of the store house isn't well lit. Probably the warehouses never have a good ventilation system. To help you get reference to a sample project work, I am providing you my own research report to view at this link. (You can download it, if you want, by clicking on "Dowload Original" button at the top right corner or simply pressing "Ctrl+S" on the page that opens on clicking this link.) Feel free to ask me questions or point out my mistakes on the report, as comments, to this post. I'll be happy to know your critiques and will try to give my opinions about your view as soon as I see your comments posted. Have a happy time doing your researches and assignments. I hope my sample will help you out. Mr. Dhrubatara Lamichhane at his own honey retail shop situated in Bharatpur - 7, krisnapur.